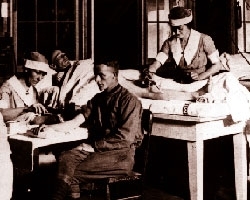 Physical therapy has come a long way from its humble beginnings around the WWI, treating our maimed soldiers. Now they have over 95,000 members in the US and requires a Doctorate Of Physical Therapy degree. In most states they are able to treat without a physicians prescription and you are now able to connect to a physical therapist virtually. Physical therapists have been there to assist us in the most difficult of times….a literal ray of light in the face of serious injury. Whether holding onto us, as we take our first steps back to recovery, or guiding us with empowerment. The physical therapist is there every step of the way, throughout the recovery process. Deservedly, physical therapy celebrates a month of recognition. Not only is direct access convenient, but numerous research articles have shown positive results.5-12 These results include: decreased length of the condition, decreased cost, decreased visits, decreased opioid prescriptions, and decreased unnecessary radiographic exams.5-12 With health care costs out of control, it is a wonder why more insurance companies are not pushing direct access. Musculoskeletal Disorders (MSDs) are the aches and pains that we feel in our muscles and joints from an injury or for no apparent reason. Physical therapists are schooled in assessing and treating these disorders, ranging from low back pain to ankle sprains.4 The question is, why is the standard protocol to first go to a physician and get a referral for physical therapy? The physical therapist is the specialist in treating muscle and joint problems, so if you are in pain you should be able to go directly to a specialist for that pain. On average the length of time to see a physical therapist by prescription from a physician is 62 days, and only 25% of those in pain from a musculoskeletal problem actually see a physical therapist.12 Maybe this is part of the reason that musculoskeletal disorders cost over 20 billion dollars per year. A comparison would be Allegra - for years it was required that you go to a doctor and get an antihistamine prescription. Now, it is sold over the counter, because it was found to be safe for consumers. To treat your seasonal allergies, you simply visit the local pharmacy without seeing your primary physician. Thus, saving time, money and stress. Is Direct Access safe for the consumer? One hesitancy of removing the physician may be the fear of missing a medical diagnosis. But research has shown that physical therapists were comparable to orthopedists in the knowledge of musculoskeletal disorders and above other physicians and medical students.5,6 Strep throat, ear infections, influenza, and similar conditions are not musculoskeletal, and you would go to your primary care physician at the onset for treatment. Malignancies, infections, fractures, inflammatory diseases are all medical ailments for which the physical therapist would not diagnose. Instead, the patient would be referred back to a physician for diagnosis and treatment. This would remain true for anything outside the scope for which the therapist has been trained. During the month of October give a “thumbs up” to your favorite PT, like them on your social media and spread the word about direct acces. *The states of Alabama, Illinois, Mississippi, Missouri, Texas and Wyoming continue to have significant restrictions. *Insurance coverage: Workers compensation, Motor vehicle and Medicare require a prescription for payment – defeating the convenience of direct access. 5. Childs, et al. A description of physical therapists' knowledge in managing musculoskeletal conditions. BMC Musculoskeletal Disorders.2005:6(32). 6. Moore J, Goss D, Baxter R, et al. Clinical Diagnostic Accuracy and Magnetic Resonance Imaging of Patients Referred by Physical Therapists, Orthopaedic Surgeons, and Nonorthopaedic Providers. JOSPT. 2005:35(2)67-71. 7. Piano, et al. Direct access to physical therapy for the patient with musculoskeletal disorders, a literature review. J Phys Ther Sci. 2017:29,1463–1471. 8. Pendergast, et al. A Comparison of Health Care Use for Physician-Referred and Self-Referred Episodes of Outpatient Physical Therapy. Health Sev Res 2012. 47(2): 633–654. 9. Childs, et al. Knowledge in Managing Musculoskeletal Conditions and Educational Preparation of Physical Therapists in the Uniformed Services. Military Med. 2007:4,440. 10. More et al., Risk Determination for Patients with Direct Access to Physical Therapy in Military Health Care Facilities. JOSPT.2005:35(10)674-8. 11. Boyles, et al. Physical Therapist Practice and the Role of Diagnostic Imaging. JOSPT. 2011:14(11),829-837.